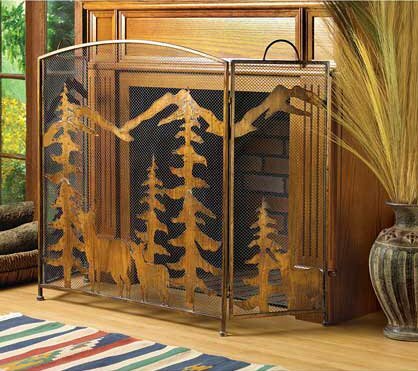 This is for a rustic bronze finish forest fireplace screen wrought iron from Shopatusm. Magnificent metalwork fire screen features cutout silhouettes of deer and mountains; absolutely magical when backlit by firelight! Weathered bronze finish gives this the instant appeal of a well-loved antique. Three-part folding design with mesh screen. Item Weight: 10 lbs. 54 inch x 1/2 inch x 32 1/2 inch high. Wrought iron.